Each summer, UVA Law students show up at a wide variety of offices ready to spend a few months learning on the job. They work at firms and government offices, in judges’ chambers, and public defender offices. And the vast majority of them are asked to do one thing: Write. A summer internship is a great opportunity to learn how to work as an attorney. The ideal internship would involve interesting, substantive work. The goal is for students’ supervisors to realize early on that UVA Law students are not only intelligent and likeable, but also immediately useful. Once that realization kicks in, they invite the student to do more than just background research. The summer job becomes a better, more enriching experience. Writing is often the key that opens the door. 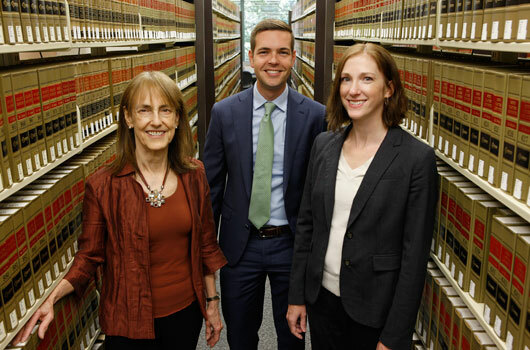 The Law School’s Legal Research and Writing Program prepares students to produce professional work that says “lawyer,” not “intern.” Through a series of increasingly difficult writing assignments, students learn how to organize legal analysis and present a polished piece of writing. The program, taught by Ruthie Buck ’85, Joe Fore ’11, and Sarah Ware, engages students with both neutral analysis and advocacy. In the fall, students research and write neutral memoranda evaluating a fictional client’s legal problem. In the spring, students write an appellate brief and argue their case before a three-judge panel. The assignments expose students to an array of emerging and challenging areas of the law. Recent topics have included the reach of a district court’s equitable powers under the RICO Act, the impacts of the Endangered Species Act on alternative energy projects, and the availability of the innocent owner defense in a federal civil forfeiture action. The course prepares students to hit the ground running. Summer experiences build to post-graduation job offers and long-term career options. In a competitive job market, proving value is key. A UVA Law graduate working at a Richmond law firm put it simply: If a summer intern or new associate turns in a weak piece of writing, he doesn’t give that person any more work. Because of their communications skills, UVA students often find themselves invited into the most interesting work. Ralph “Chet” Otis '17 interned for a district court judge this past summer and was asked, along with interns from several other top law schools, to write bench memos. They were given two weeks to complete their memos. Otis needed only one week to complete his first one. He then experienced the thrill of having his words appear in the judge’s opinion. He credits UVA’s Legal Research and Writing Program for giving him the tools to turn out a solid work product so quickly. Indeed, Otis estimates he wrote 13-14 bench memos over the course of his internship. In addition to instruction and feedback from the Legal Research and Writing faculty, students receive detailed comments on multiple drafts from student teaching assistants. UVA’s tradition of student collegiality is reflected in the Dillard Fellow Pogram, which pairs up each new student with a 2L or 3L teaching assistant. Connor Crews ’16 found great value in the relationship. “The program provided me with access to an experienced student colleague who analyzed my work in a low-pressure environment and taught me that accepting criticism is critical to developing as an attorney.” Crews went on to serve as a Dillard Fellow himself, helping the next class learn to write with logical rigor and clarity. The program also helps students learn how to talk about their analysis. The spring oral arguments program is a highlight for both students and alumni. More than 100 alumni return to act as judges for what is, for many of our students, a first attempt at oral advocacy. The judges’ questions and feedback help students build confidence in their oral advocacy skills. That skill set helps in a variety of settings. Gretchen Nygaard ’11 started her career at a prestigious law firm in Washington, D.C. “During one of my first annual reviews, many of my reviewing partners commented that not only did I write clearly, but I effectively communicated about my written work product. The UVA program taught me both to write and to speak with clarity about my research and writing.” She is now working at the Department of Justice.